In our solar system, the moon orbits around Earth. Earth – and the other planets – orbit around the Sun. The stars also orbit around the Sun. Have you ever wondered why the Earth, the other planets, the moons and the stars just don’t go flying off on their own into space? What keeps them on their track? All about orbits, where the planets and stars travel on an elliptical path around the Sun, which keeps them from falling into the Sun. The answer is gravitational forces. The Sun, as well as the planets, has a magnetic field that attracts smaller objects and holds them in place. But, you ask, why don’t the planets fall into the Sun? When you point a magnet at a paper clip, the paper clip becomes attached to the magnet. Why don’t the planets do the same thing? Lots of things orbit in space that were put there by man. 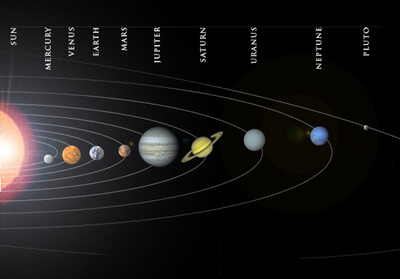 The planets and stars travel on an elliptical path around the Sun, which keeps them from falling into the Sun. Here’s a useful explanation from Cornell University. Say Superman threw a ball across the sky. The ball would go a long way, but eventually it would begin to fall. Because Superman threw it with such force, the ball would go all the way to the horizon, or the rounded edge of the Earth. Because the Earth is turning, the ball falls, but it never actually drops to the ground. It simply travels around the Earth. This is how orbit works. The moon orbits around the Earth, while the Earth orbits around the Sun. The Sun, as well as the planets, has a magnetic field that attracts smaller objects and holds them in place. A video explaining how satellites orbit the Earth. Question: What else orbits in space besides the planets, moons and stars? Answer: Lots of things orbit in space that were put there by man. 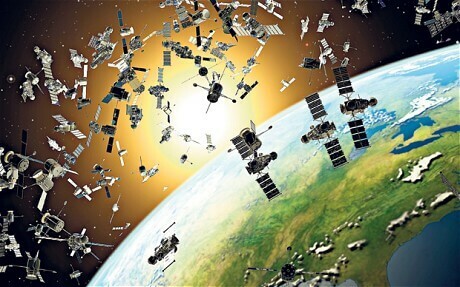 Satellites orbit the Earth, taking photos, regulating cell phone use or reporting weather patterns. Rocks, dust and debris also orbit the planets or the Sun. Enjoyed the Easy Science for Kids Website all about Orbit info? Take the FREE & fun all about Orbit quiz and download FREE all about Orbit worksheet for kids. For lengthy info click here. Declan, Tobin. " Orbit Facts For Kids ." Easy Science for Kids, Apr 2019. Web. 21 Apr 2019. < https://easyscienceforkids.com/all-about-orbit/ >.